When you fish with Shaun Swain of Rangeley Lake Guide Service, you will have the opportunity to experience Rangeley, Maine in a way that will make your vacation unforgettable. You can sit back, relax and take in some of the most beautiful scenery Maine has to offer, with beautiful sunsets and quiet sunrises. Often early in the morning, while enjoying a cup of coffee, ospreys, great herons and eagles can be seen fishing from the air. Occasionally, moose and deer are seen wading near the shore. There are always loons floating about with their young, being taught to fish. They share the lake with the several species of ducks which abound. You will be trolling Rangeley Lake for salmon and brook trout. All of the tackle needed is provided, and if you desire, you will be offered full instruction on equipment and technique. The most prevalent species in Rangeley Lake is Landlocked Salmon, a freshwater cousin to the Atlantic Salmon. They range from one to seven pounds. The average two to three pound fish will fight like no other cold water species. Ice out is in early May, and the fishing can be fast until late June. Consistent fishing can be had in July and August, using downriggers to go to the depths of the fish. In September the leaves start to turn and the lake settles down. The larger fish are preparing to spawn in the streams and coves, and fishing is great. Shaun has been fishing Rangeley Lake for forty years; he knows Rangeley Lake and is pleased to introduce you to some of his favorite spots as you fish the lake. Shaun's great-grandfather was a well known guide on Rangeley Lake at the turn of the century. This was a time when people would arrive by narrow gauge railroads, stay in the large hotels and travel across the lake by steamboat. In the 20's Shauns grandfather bought a farm on the lake upon which he built 14 sporting camps on the shore of Rangeley Lake, eventually giving up farming to cater to the tourists. Shaun's father now runs those camps. Shaun operates Meadowood Cabin, a rental cabin overlooking Rangeley Lake and Saddleback Mountain, which was his childhood home. 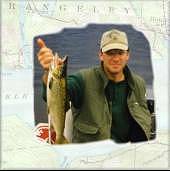 Shaun is very proud to guide those who want to spend some time on the water and fish for Rangeley salmon and brook trout.